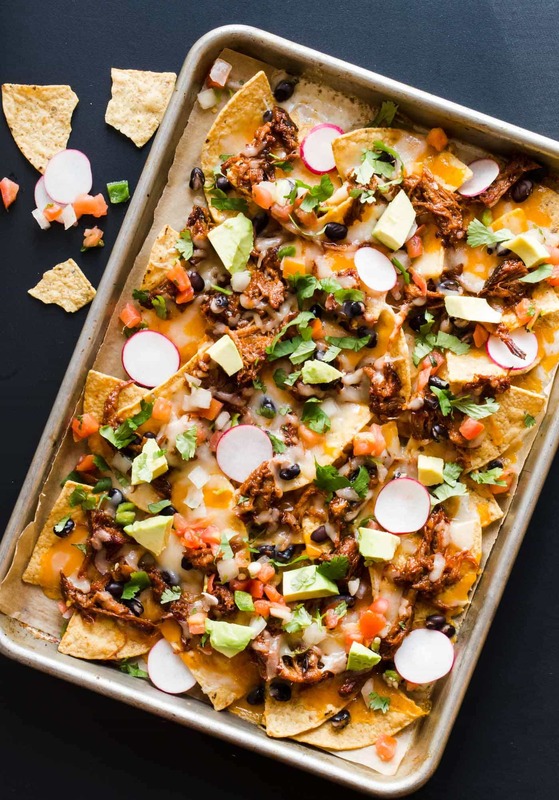 These BBQ Pulled Pork Sheet Pan Nachos make perfect party snacks and couldn’t be simpler to pull together for last minute guests! 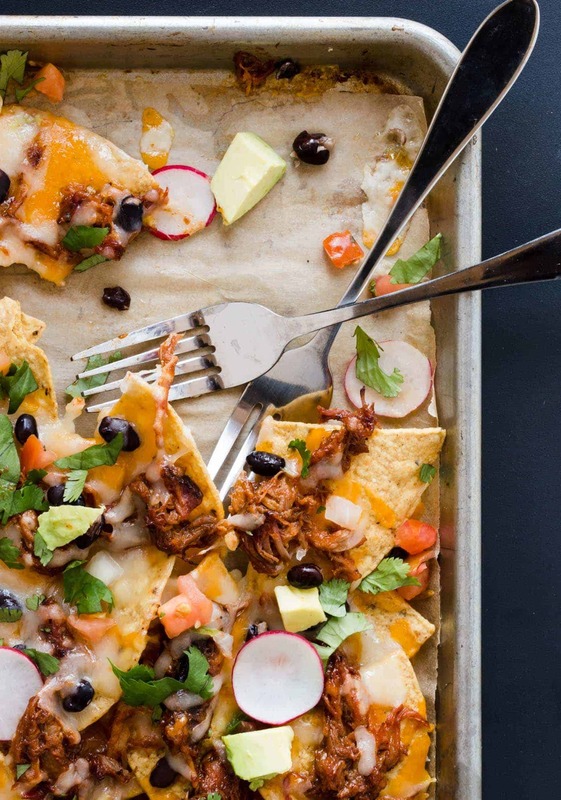 Nachos are always crowd pleasers for any group, but these BBQ Pulled Pork Sheet Pan Nachos elevate the cheesy chip goodness to even greater heights. Plus these nachos are made and served on a sheet pan, which keeps the mess (and clean up) to a minimum. What host or hostess can argue with that? This recipe is more of a guide than a strict set of rules for creating your sheet pan nachos. You can buy your favorite BBQ pulled pork at the grocery store or make your own if you have the time. (Need a reliable recipe? Our Three-Ingredient Pulled Pork recipe couldn’t be easier!) We’re big fans of the combination of sharp cheddar and mild monterey jack cheeses on these nachos, but feel free to use your favorites. Black beans? Optional, but totally worth it. The same goes for the cilantro, radishes, avocado and pico de gallo. Tip: Have a few extra minutes? Shred your own cheese. There’s absolutely nothing wrong with buying pre-shredded cheese (we do it all the time), but know it contains additives to prevent the cheese shreds from clumping in the bag. The result is the cheese doesn’t melt quite as well. Block cheese doesn’t have those additives and melts very smoothly. Plus it’s usually cheaper than pre-shredded cheese. Layer tortilla chips on a sheet pan. Add desired amounts of pork, cheese and black beans. Heat for 6-8 minutes or until cheese is fully melted. Top with cilantro, radishes, avocado and pico de gallo. Serve immediately.